The food I cook. The food we eat. 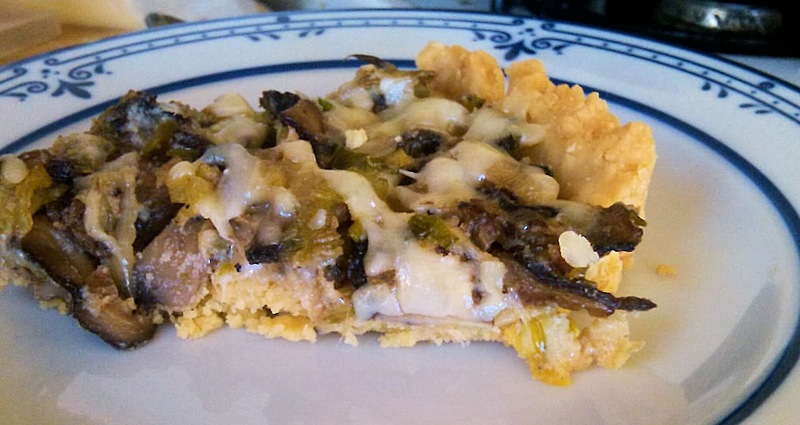 It was my cooking compadre's idea to make the mushroom tart for brunch. 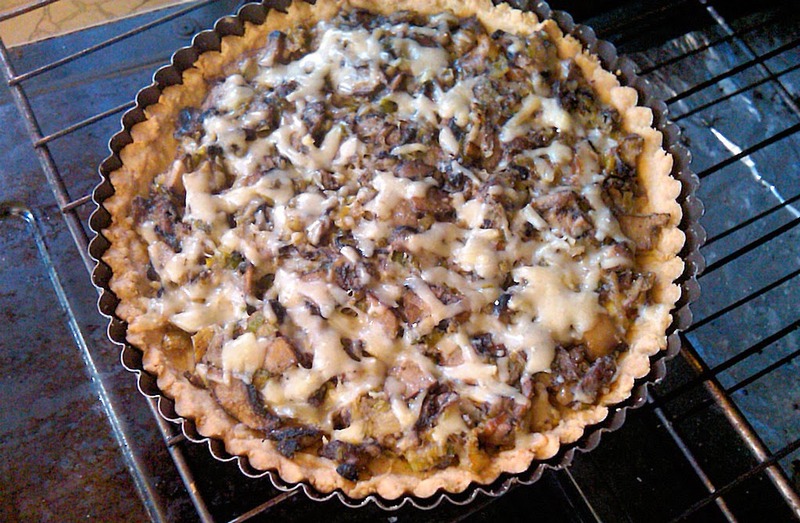 She looked at a few recipes and had an idea of what it should be like: very mushroom forward (no eggs - we didn't want a quiche) with a nutty cheese. Both of us feel strongly that leeks are the right choice. They have such a buttery flavor, are ‘brighter’ than onions or shallots and they are a perfect taste companion to the mushrooms and the cheese. As we made it we collaborated on how it tasted - whether we should use ricotta or cream to bind the filling. We disagreed on herbs - I wanted to add thyme and she did not so we went without. She had an idea of what it should taste like and we went with it. I did add thyme as an optional ingredient. The only thing that I think we both would change is that we used a press-in tart crust - one she has used before and likes a lot (I do too!). 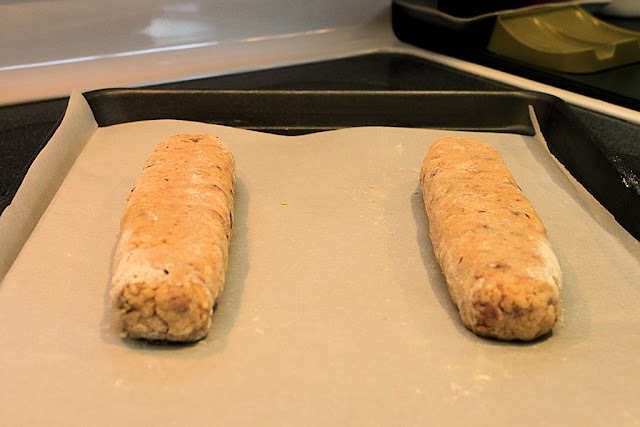 It just didn't have enough structure for the filling which was not heavy, but relatively dry. Oh well, adventures in baking! The tart was delicious and we will definitely make it again. Hands-down, the best turkey breast I've ever had. This recipe takes work, but once you've prepared the roast you stick it in the refrigerator for a couple of days and the final roasting is a breeze. My cooking co-captain and I start talking about and thinking about what we want to cook for Thanksgiving at least as early as September. This year we decided to change-up a few things: 1. 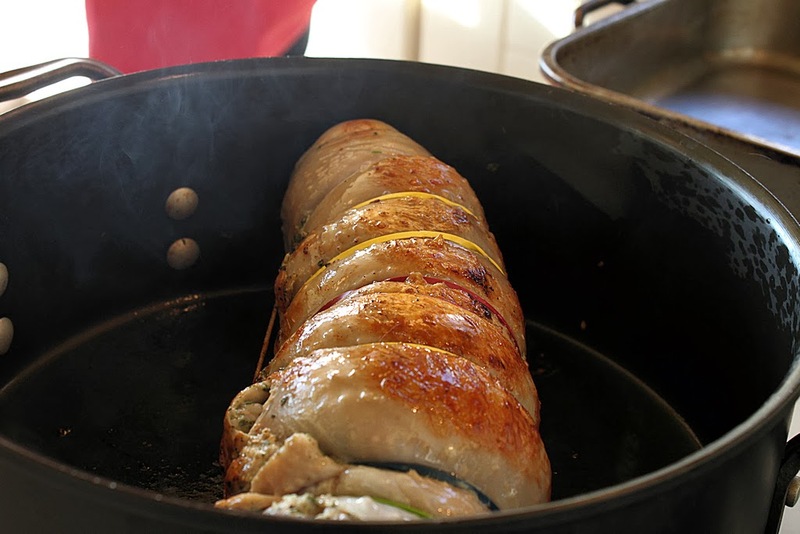 Instead of cooking a whole turkey we were going to do a turkey breast on the rotisserie and make a small-ish Porchetta. A couple of years ago we found Judy Rodger's genius recipe for "Mock Porchetta" and make it at least three or four times a year. 2. We decided to 'go simple' as far as sides go: gravy (yes, on Thanksgiving that can be considered a side), mashed potatoes, stuffing, cranberries and a salad. 3. We would prepare the meat on Tuesday and everything except for cooking the meat and making the salad on Wednesday. Then I sent her an instant message. I found this on the Serious Eats site and thought that it was cool and that we should consider this for the next Thanksgiving. Truly, my intent was not to go rogue and try and change 'The Plan'. You just had to throw a monkey wrench in our works. I want to make that Turchetta but we can't make a porchetta too. It just looks too good to pass up. We should do it. Sometime in February we can rotisserie a turkey breast but let's make the damn Turchetta....oh you just had to go looking for recipes. ...and so, we did. Here's to monkey wrenches! 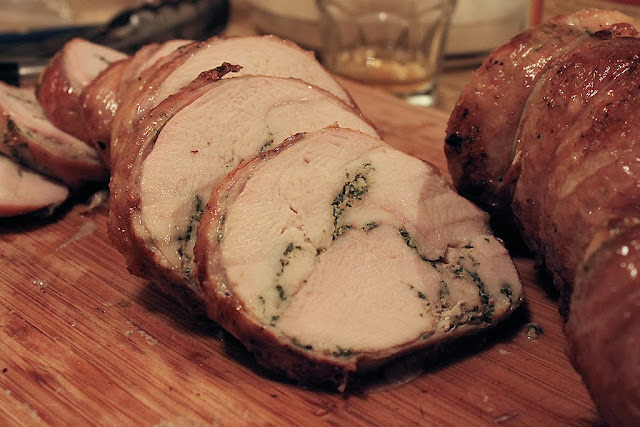 Here is a link to the Serious Eats article, The Food Lab: How to Make a Turkey Porchetta by J. Kenji López-Alt. 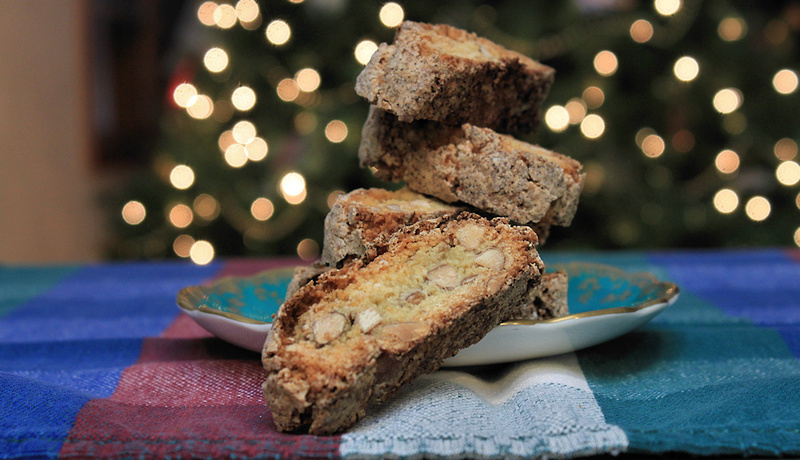 There is also a slide show link and a link for the recipe. I'm not going to post the recipe here because we did not adapt it beyond a few changes, and have additional notes on what we will and will not do the next time (see NOTES, below), and there will definitely be a next time - it was delicious. Changes to the spice and herb mix: we added the zest of 1 lemon, making the mixture identical to the one we use for Porchetta. We made gravy, instead of a jus and used a different method to make the stock. Stick with the turkey breast size called for in the recipe. We had a larger (2 times larger than the size called for) breast because we were worried about having enough leftovers for sandwiches (5 diners), and we had extra meat that was too much to roll up and fit. We ended up using much less of the breast meat and there are no problems with the leftovers for sandwiches. 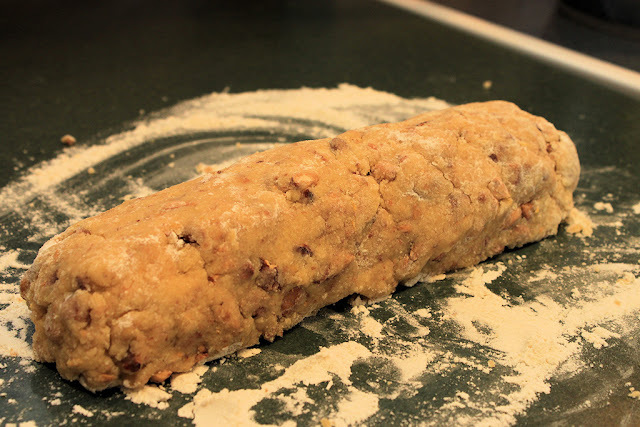 We probably ended up with a little more meat used in the roll than was called for in the recipe. 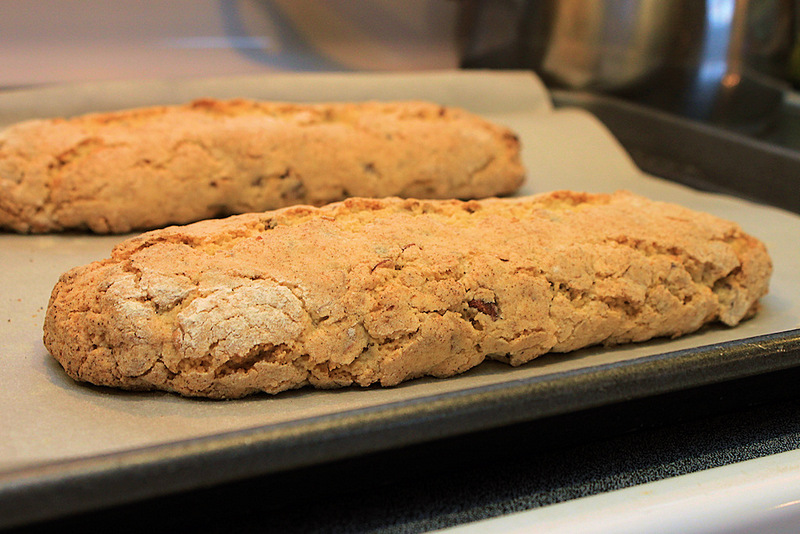 If I had to feed a larger crowd, I'd make two (as the recipe suggests). Once you're done preparing it (or them) they can (and should) sit in the refrigerator for two days and two would still take up less room than a whole turkey. After you've separated the meat from the skin. Chill them both down for 30 min in the refrigerator. It will be easier to trim the fat pockets from the skin and to handle the meat. Tying up the roast: After putting on the roasting bands (very useful - and re-usable - in many applications), we realized that we should have tied it up, as shown in the recipe, with butcher's twine. We did, before roasting, add butcher's twine along the length of the roast but next time it will be all butcher's twine. Sierra Beauties. Washed, then cut into quarters or eighths. The only tough decision you have to make is whether you want to do the heavy lifting up front (peeling and coring the apples) or at the end (getting rid of the cores and seeds and skin), by using a food mill after the apples are cooked. I prefer the latter.It also reminds me of when my mom made applesauce. 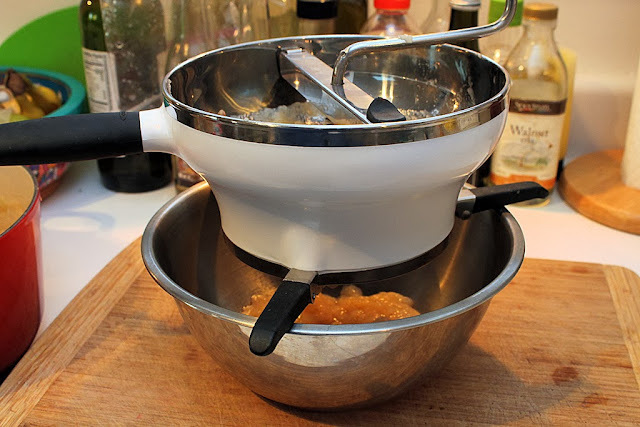 She'd cook the apples, but whatever kid that was old enough and that was closest to the kitchen was pressed into duty milling the cooked apples with the Foley Food Mill (still around, but made for Mirro). For some reason, she always referred to it by all three names, as I do now. Mine's an OXO - smaller than my mom's, with three disk sizes - coarse, medium and fine. I use the medium for applesauce. 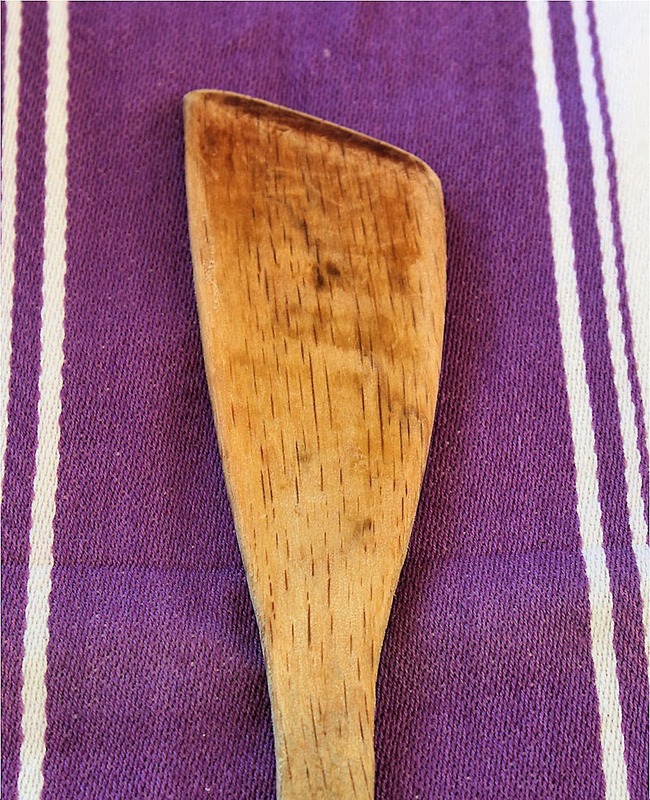 The fine disk is perfect for milling tomato sauce. The fine disk also makes quick work of raspberries (and similar berries) when I make sorbet. If I don't have time to mill, I can stick it in the refrigerator for a day but most important, you don't lose the taste and the color of the skins. If I had to choose just one apple from which to make sauce, I think I'd choose Jonathans or maybe Gravensteins, but applesauce can benefit from 2-3 types of apples. Think tart + sweet or tart + sweet + floral. 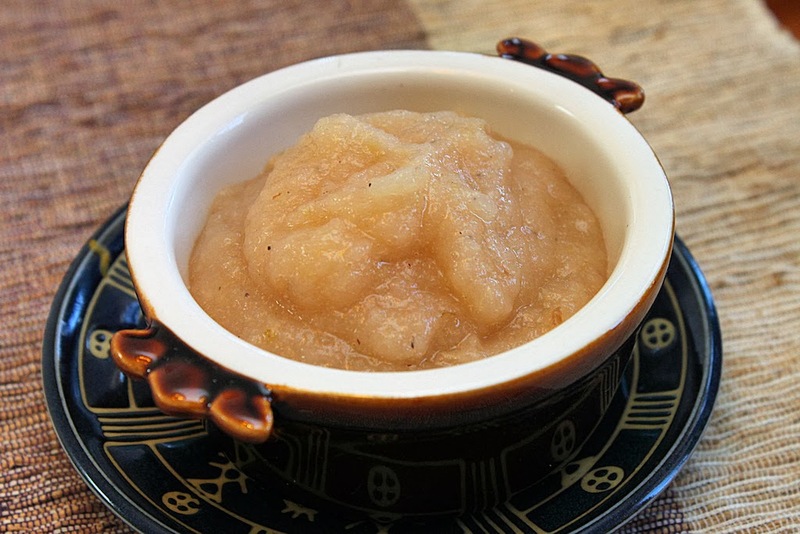 Whatever you choose, applesauce is best made from the fresh fall-crop apples. After about 15 minutes of cooking, after the water came to a boil. Liquid? 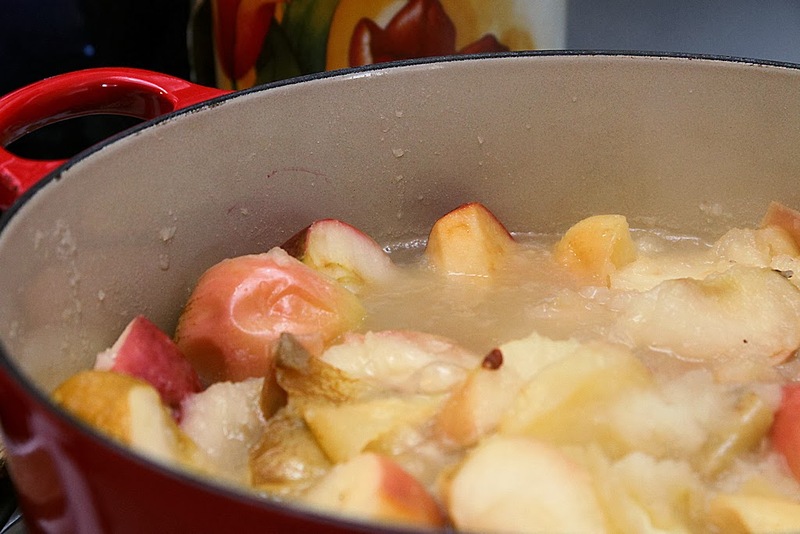 You can add water, cider or juice, but just enough so that the apples don't scorch. 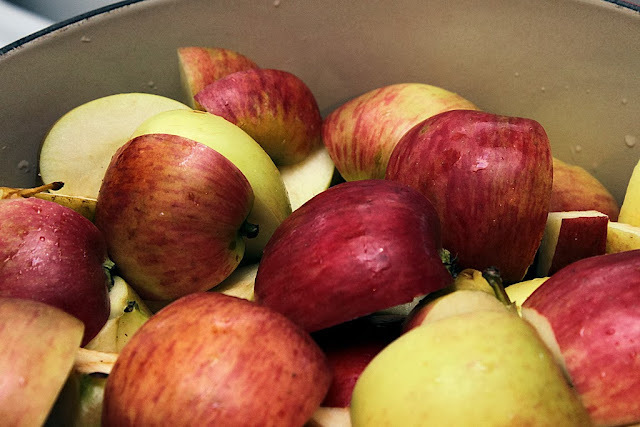 A batch of 5 pounds of apples takes about 30-ish minutes to cook and you need to be vigilant in the those last 15 minutes, stirring every minute or so and adjusting the heat down if necessary. Your best friend in those last 15 minutes of cooking is not a spoon or a silicone spatula but an angled paddle. 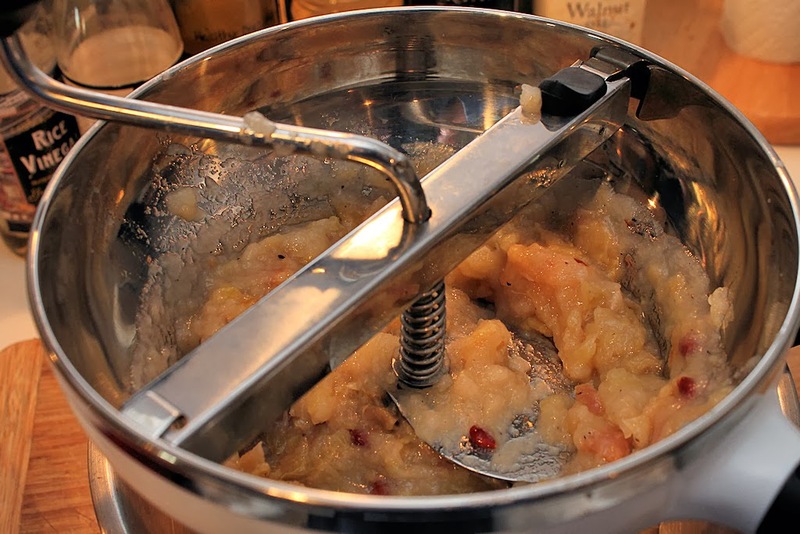 Stirring and turning the apples, clearing the sides and bottom of the pot and getting into the corners is what this tool was made for. 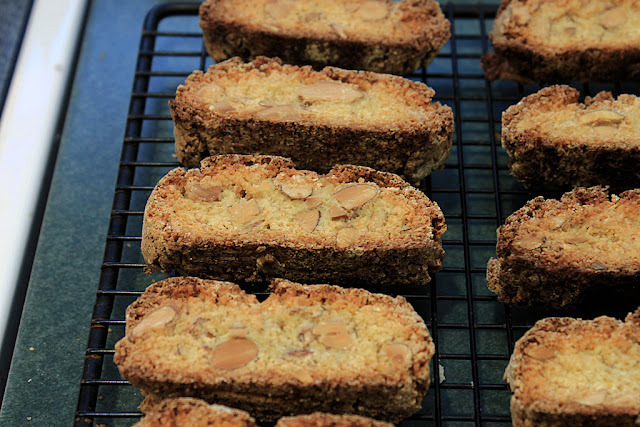 Biscotti derives from the Latin "bis coctus", or "twice baked". 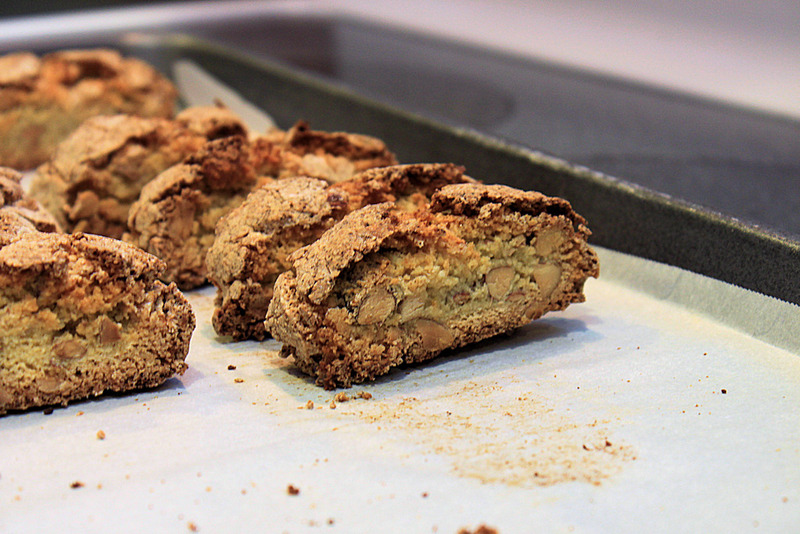 Cantucci (or cantuccini) is a"dry" type, first documented in Prato, Italy in the 13th century as "biscotti di Prato" These cookies were made for dipping - originally in vin santo (sweet wine) but I think they taste good dipped into just about any beverage but not so easy to eat alone - you could chip a tooth on these things if you don't dip 'em. 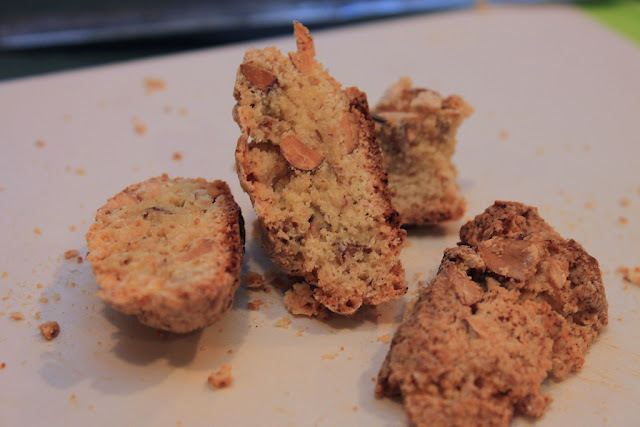 They taste wonderful when dipped and I'm serious about not waiting until you get your hands on some vin santo - dip them with whatever's at hand. My hair stylist brought these in (along with a selection of other delicious cookies) when I went in for a pre-Christmas appointment. With no vin santo in sight, I dipped my cookie into herbal mint tea and kind of fell in love and my stylist very kindly sent me the recipe, which I adapted slightly. There are endless combinations - next batch is going to be dried sour cherry and hazelnut. One of the two logs, after kneading. The only liquid besides sugar - which in baked goods world is considered a wet ingredient - are the two eggs and the dough looks impossibly dry and crumbly. When you knead it, it just barely holds together. Slightly flattened, before the first bake. After the first bake, when you cut the logs into 1/2" slices, there are some end pieces left over, a.k.a. "the cook's treats". You stand them up to bake the second time and they're done when they're just a little soft in the middle. After the 2nd bake, let them cool completely. 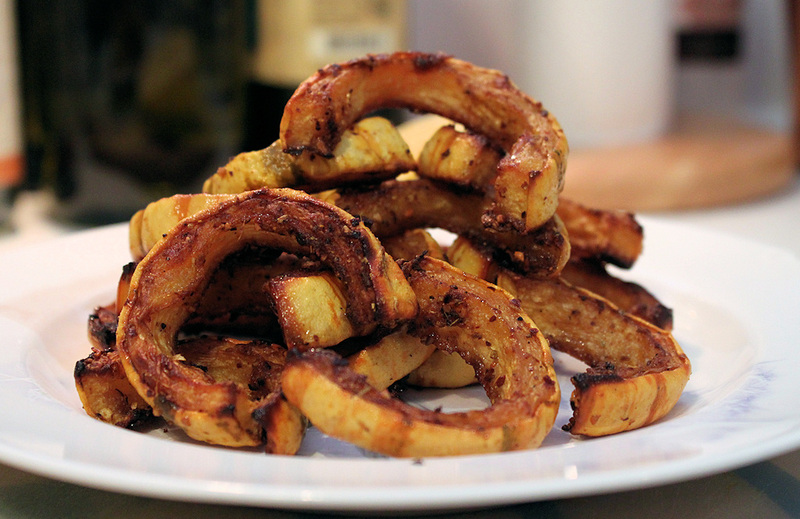 This is dead easy and all you have to remember if you want crispy edges is, "the magic number is three". 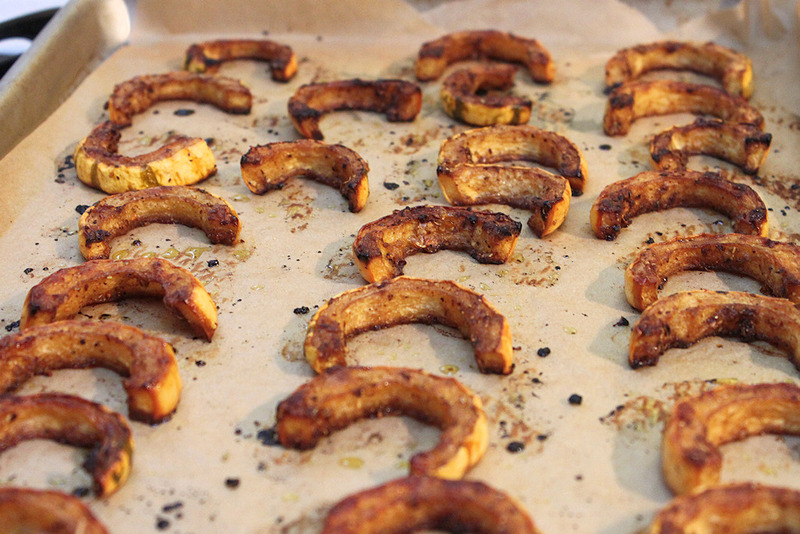 The Delicata squash half-moons are cooked on one side, turned to cook on the other side and then turned to cook on the original side once more for crispy edges and creamy flesh. There may be other ways to achieve this, but this is my method learned by trial, error and, finally, success. 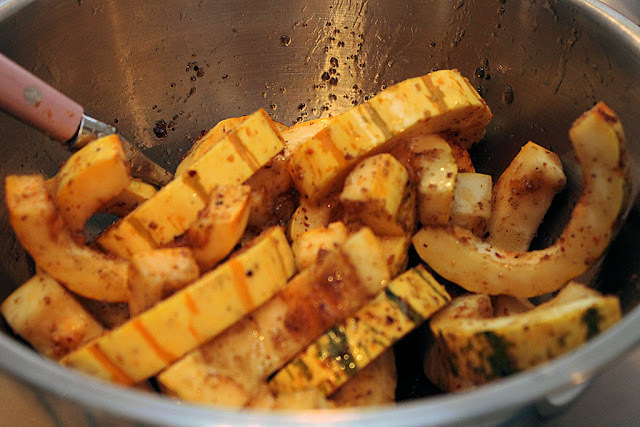 Sometimes, as I did this time, I add about 1 1/2 teaspoons of brown sugar per squash when I'm tossing them with a very small amount of olive oil, salt and pepper but you can omit that if you wish. 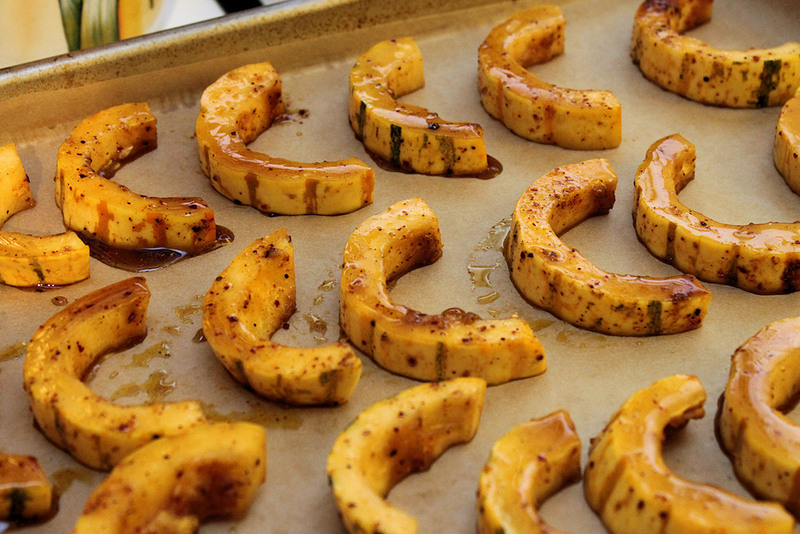 Occasionally I sprinkle some balsamic vinegar on the slices instead of brown sugar before they go into the oven. I liberally sprinkled the half-moons with Ras el Hanout, but mostly what I was left with was a mild aromatic flavor and some of the heat from that spice mixture. 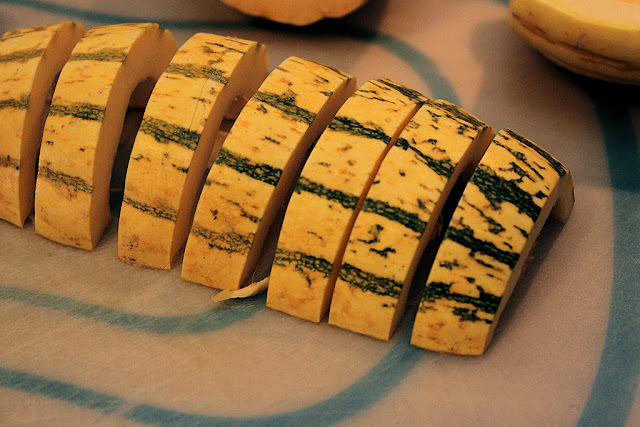 Delicata squash is a more-or-less dirigible-shaped white or yellow squash with green or orange-gold longitudinal striations and a pale yellow-orange flesh. It's classified as a winter squash, but is very thin-skinned. When roasted, the skin is very easy to eat. You can roast it, stuff it and bake it, saute or steam it.. It's not as packed full of beta carotene as some of the other winter squashes, but has good fiber, potassium, and vitamins C and B. © 2011 Riffin' in the Kitchen All Rights Reserved. Simple theme. Powered by Blogger.